Just viewing the photo makes my ears ring! 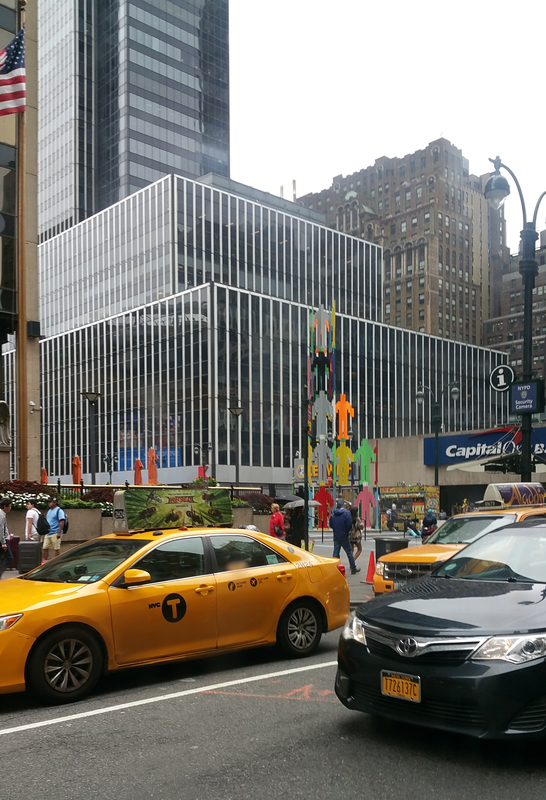 The cacophony of car horns, traffic, and the swirl of people on an average day in midtown Manhattan makes me woozy. It’s too much: too much noise, too many people, too much aggression, everyone vying for their place. When I lived in New York City I learned to walk with arms akimbo, elbows out, so I could have my own space on the sidewalk and not be run over by some mindless drone looking at his cell phone screen while zooming down the street. The endless jockeying and competition, the noise pressure, and the thump thump heartbeat of the City are a siren song for some but alas, not for me. When crossing the street became an art form as skilled as ballet, when maintaining my four-square feet of personal space became an obsession, when the subway became my greatest source of entertainment, I knew I had succumbed. I was indeed a New Yorker. Ya gotta love it! Or hate it! But nobody can stay neutral about it: New York. Everywhere you look something new pops out. One day you may see performers, the next day pigeons, then the glitz of Broadway and Times Square, and the next day homeless people, but something always catches the eye. But oh, the sounds! The noise. The cacophony of car horns and trucks backing up, scratching against the strains of street performers and buskers. The subway cars that sound like the opening strains of “Somewhere” from West Side Story: There’s a place for us…. Yes, there’s a place for us going uptown. I took my fingers out of my ears and held up the decibel meter when the train approached the platform. It routinely topped 85 dB. “Mom, you look silly,” my children decried. “Nobody does that.” “I do,” I countered. My hearing and tinnitus thank me for blocking some of the extraneous sound. …and fire engine and police sirens of the uneasy urban soundscape which comprises Baltimore’s night. 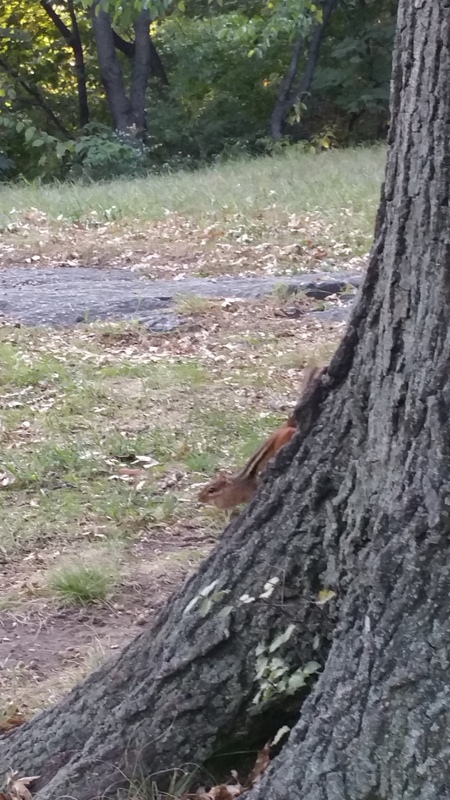 Chipmunks scampered busily around the base of a tall pin oak in Central Park. Acorns dropped steadily as I watched them run across the grounds, up and down the tree. I’ve never seen so many chipmunks all together out in the open! I’m used to seeing a single chipmunk darting across my path while I walk on a wooded trail. To see this group of at least a dozen at a time was quite a treat. I couldn’t catch them with my camera; they ran too fast! Not a squirrel was in sight. I wondered if a chipmunk posse had chased them away. I imagined gangs of wild chipmunks intimidating the rodent population of Central Park. They’d be wearing little fedoras and spats à la 1930s gangsters. “Beat it, fur face,” the tough one would squeak menacingly in a Bronx accent. ”Dis here tree is our turf.” A mini-drama would ensue: nuts flying, fur bristling, little squeaks erupting like machine gun fire. Marauding chipmunks? Menacing squeaks? I think it’s time for coffee! People plant fruit trees because the blossoms are beautiful. They bloom in the spring about the same time as the early flowers such as daffodils and tulips. Fruit trees frequently make up a portion of formal plantings that bloom in sequence. Think of the cherry blossoms that adorn Washington, D.C.
As a child I learned how to identify plants by their leaves and trees by their bark in nature studies classes. I would spend hours hiking in the woods marveling at the diversity of species in my area. I retained these skills into adulthood and at some point became a gardening enthusiast. Although I lack a garden now, I enjoy looking at other people’s plantings. I like seeing how each apartment building distinguishes itself from the next in the foot-wide strip of soil between it and the pavement. Hence, I stop to “smell the roses”—or Rose of Sharon—whenever I can. There are few fruit trees in Washington Heights. It is a Jewish custom to say a particular blessing over a blossoming fruit tree in the springtime, in the Hebrew month of Nissan (approximately mid-April to mid-May). Since most New Yorkers can’t identify fruit trees by their leaves and bark, lacking the nature studies classes I enjoyed, some Jews took it upon themselves to publish a map identifying the fruit trees in the certain neighborhoods! Some people even hang a placard from fruit trees with the text of the blessing to aid their fellow Jews. There is one such tree on Bennett Avenue across from the Mt. Sinai Jewish Center. I visited that tree and said the blessing at the appropriate time last spring. I knew about this particular tree on Overlook Terrace without seeing it on a map. I’d espied it and watched the fruit all summer. It’s unusual to see fruit tree blossoms that actually come to fruition in the city. 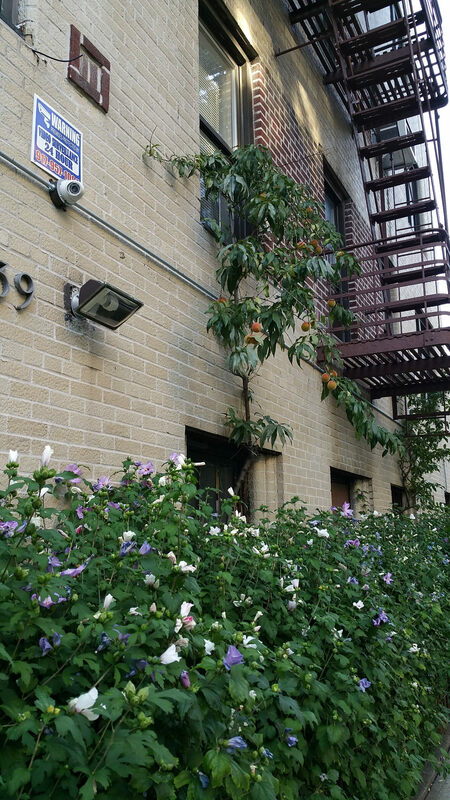 It’s even more unusual to see one of these trees smack dab up against a building, adjacent to a fire escape, hiding behind a hedge of exuberant Rose of Sharon. Peering at the tree, I spy little blushing peaches emerging from under the leaves! It lives! It is growing!! Next to the subway station yet!!! There used to be farms in this part of Manhattan. Oh, it was long ago, but it is indeed documented. What would those farmers say about their acreage now? How could this tree happen to grow precisely here? Did an opportunistic peach pit grow between the hedge and the bricks? Not likely. Unsprouted peach pits that are hundreds of years old have been excavated from the trash heaps of Old New York. These hard hearts don’t sprout easily. Could someone actually have planted this tree? Maybe. There is evidence it is cared for: it is tied where it intersects the top of the ground floor window. There’s a scar where it had been pruned. Will these peaches rot on the tree, get pecked by birds, or be plucked by the person whose window they cover? Someday I expect I will emerge from the subway station and see some nouveau urban farmer climbing a ladder to harvest the peaches. Straw-hatted and overall-clad, he will set each booted foot carefully on the rungs as he climbs. He will test the ripeness of each with a little squeeze. He will pluck each one and lay it in a wicker basket depending from his arm like in an old-timey painting. Thus he will reanimate the ghosts of long ago farms in this part of the island. A fanciful dream, but what a dream! I rode the M2 bus through Harlem last week. It follows 7th Avenue, also known as Adam Clayton Powell Jr. Boulevard, below 155th Street. The neighborhood looks much like my own with apartment buildings housing small businesses on street level lining the streets. Some buildings boasted elaborate cornices belying their ages but others showed the worn look of properties that have been purposed and repurposed over the decades. Nail salons, restaurants, cell phone shops, storefront churches, schools, and groceries hunkered by the sidewalks. When I alit near my destination, I enjoyed walking along the pleasant boulevard as it neared Central Park. After my business was complete, I made my way to catch the C-train. 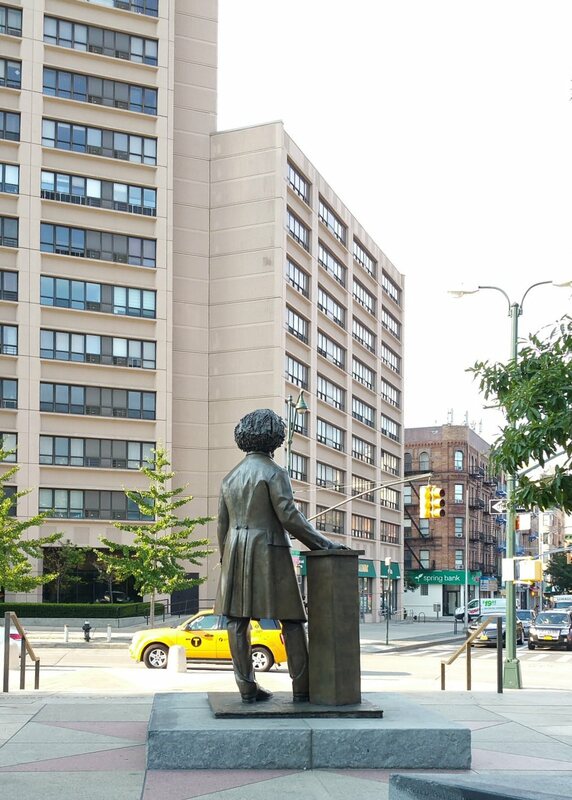 I had never taken the subway to the Cathedral Parkway station so was unaware of the striking memorial awaiting me at the corner of 8th Avenue (Frederick Douglass Boulevard) and 110th Street. The Frederick Douglass Memorial boasts an eight-foot bronze portrait sculpture as well as a focal fountain wall. Frederick Douglass stood in his generation as a defender of human rights. A refined man and former slave, he became an abolitionist leader, a prolific writer, orator, and publisher. His voice still resonates. 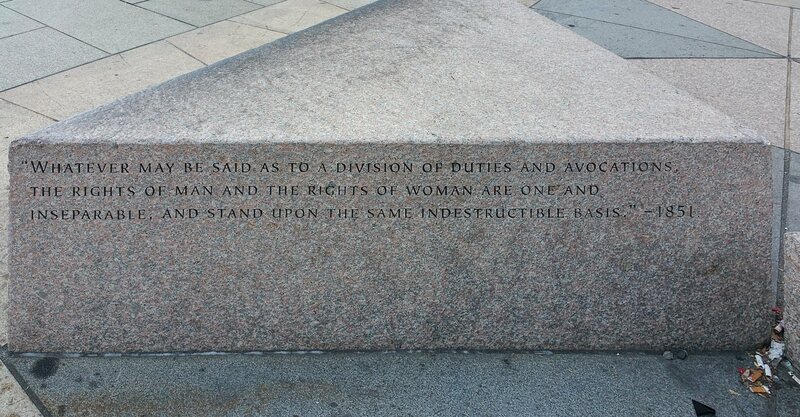 Large granite blocks immortalize his words at the memorial. The plaza itself greets visitors with stellar words from the masthead of his newspaper, The North Star, carved into the paving. It is well worth taking the time to pay a visit here. It is our duty to think upon the freedoms conferred on us and about those who have fought for these rights to apply to all men and women. I was hot. The turbaned shopkeepers greeted me with smiles and went on conversing in an Asian language I didn’t recognize (why I think I’ve an ear for languages is another story). The store was not icily air conditioned, unfortunately for me, but the men didn’t seem bothered. Although it was one of the hottest days we’ve had, they showed no discomfort. I, on the other hand, patted my face with a drooping tissue. When Ramadan occurs in the hottest months of the year, the fast must be a sure sign of devotion! As a sewist (the latest term for someone who sews), I let my fingers do the looking. Every bolt of fabric, every roll of upholstery begs to be smoothed, pinched, and petted. Some fabrics, sirens like velvet, call out louder. “Hello fingers,” velvet croons. Others desire to be admired under different light conditions. Brocades, silks from China, and dichroic fabrics that appear to change color depending upon the incident light beg to be wiggled. I like to hold my hand under sheer materials, observing its outline. “The Garment Worker” by Beyond My Ken – Own work. Licensed under GFDL via Wikipedia. 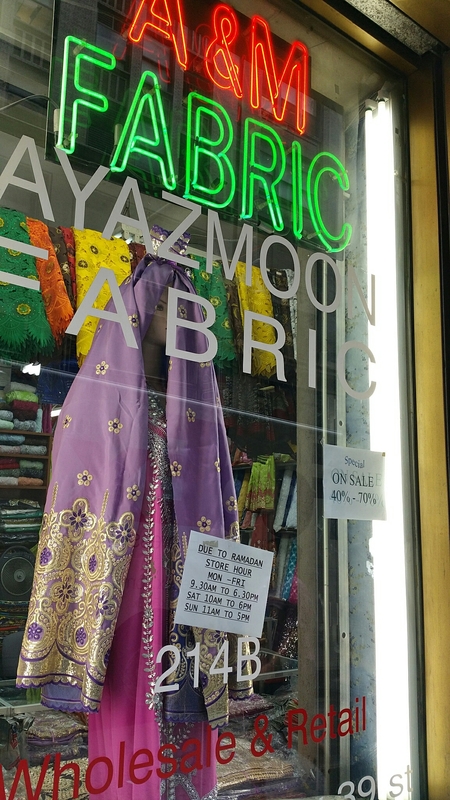 I thought the Garment District would have Jewish shopkeepers, reminiscent of the famous statue of a tailor, “The Garment Worker” by Judith Weller at 555 Seventh Avenue. Not so. The majority of stores I entered on 39th Street were populated by Asian men, many wearing turbans. When did this happen? I picked up a bolt of 45-inch wide stretch fabric with rainbow metallic threads. Yum. They hovered while I scanned my smartphone, trying to mentally calculate the yardage I’d need for an outfit while trying to Google a half-remembered pattern I sewed 22 years ago. I switched to a 60-inch wide roll of Indian embroidered cotton eyelet. “Three-and-a-half yards,” I confidently said while not feeling so confident. At least the wider yardage will give me some leeway. The shopkeeper calmly measured out the fabric while I dreamt of the creations I could make. I haggled for “$5 worth” of a coordinating rayon. I haven’t measured what he assured me was a greater length than I would have gotten for the quoted price per yard. My purchases in hand, I headed to The Coffee Bean & Tea Leaf for an icy coffee confection. Decaf, but with whipped cream. I followed no Ramadan restrictions and golly, I was hot. The car next to mine wasn’t so lucky. Parking in Washington Heights, and I assume in all of Manhattan, plays like a game of roulette. Sometimes you win, sometimes you just have to try again. Closer to home is better, naturally, but I have parked nearly a mile away (20 minute walk without bags) a number of times. I can usually assess when parking will be found without cruising around. Certainly, after 10 p.m. you can forget about a parking space. That’s when I cruise over to my favorite lot and say ¡hola! to the guy who knows me (or my car) already. Gracias por tu ayuda, and hand over $12 in the morning. I had parked Freddie Ford on the Friday side and today is Friday. I hastened up the hill to rescue Freddie before the parking tickets would begin to multiply. Sweating profusely, I walked along Amsterdam Avenue, nearly ¾ of a mile from home, where I’d placed my car the other day after a fruitless half hour of riding around (before 8:30 p.m. yet!). I noticed broken glass glistening in the street in already empty spaces. A frisson of fear ran along my back and I walked further down the row. 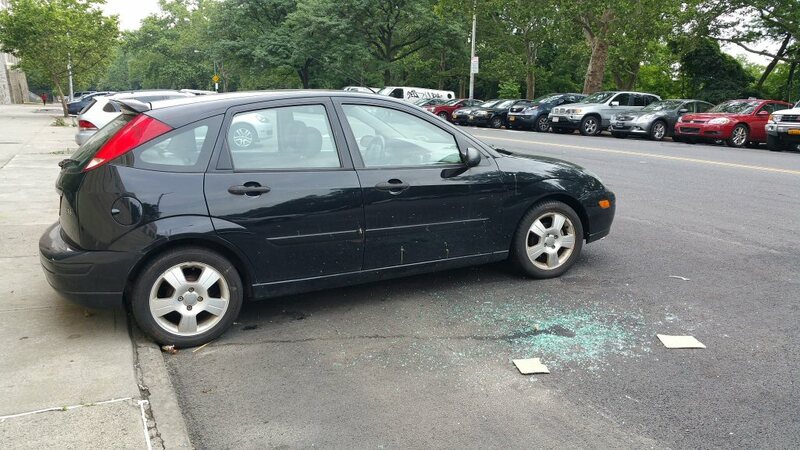 The car next to mine had been broken into, apparently. I feel like I dodged a bullet. Already on three occasions I found Freddie’s driver’s side mirror missing. I didn’t need to deal with broken auto glass. Could it be that the thieves had compassion because there was a crushed liquor mini under the rear tire? Maybe they sensed that the CD changer doesn’t work and it frequently doesn’t play CDs either. It’s probably more so that my car is older and uninteresting. (Sorry, Freddie.) Blah. I keep the interior clean-ish without anything enticing peeking out. Likewise the trunk space is empty. There are some maps in the door pockets and a snow brush (in June!) on the back seat floor. Freddie Ford now sits patiently in a Wednesday side of the street space, waiting for his next big adventure. I’m glad “he” is patient! I got married on Memorial Day. A Monday holiday’s convenience for time off and travel made that the most feasible choice. No barbecue, but lots of sunshine… and humidity. The food was good, the guests had a good time, and we did what we set out to do. Now we are guaranteed a day off to celebrate the day every year, too! Memorial Day has devolved into a day of national leisure and big $ale$. I sense we’re less concerned about remembering the people who died while serving in the country’s armed forces than we are interested in satisfying our own indolence. The grand parades of earlier times are figuratively replaced by red, white, and blue bunting on some stores. How many of us make the effort to go to the big parade in town? Rather than sounding like a crotchety old granny, I’m happily remembering Memorial Day last year. We spent the afternoon at Van Cortlandt Park. It was packed! So many families came to enjoy the day together. Grills, bags of charcoal briquettes, picnic baskets, coolers, blankets, chairs, games, balls, and radios magically appeared. How was all of this stuff transported? Did people actually drive there? If so, where did they park (parking being my perennial concern)? I have a humorous vision of people pouring out of the A-train burdened with all these chattels. Plus babies, toddlers, strollers, and diaper bags. Also sports equipment like bats, soccer balls, badminton nets, and whatnot. Picture that flood erupting and spilling down the steps at 242nd Street! 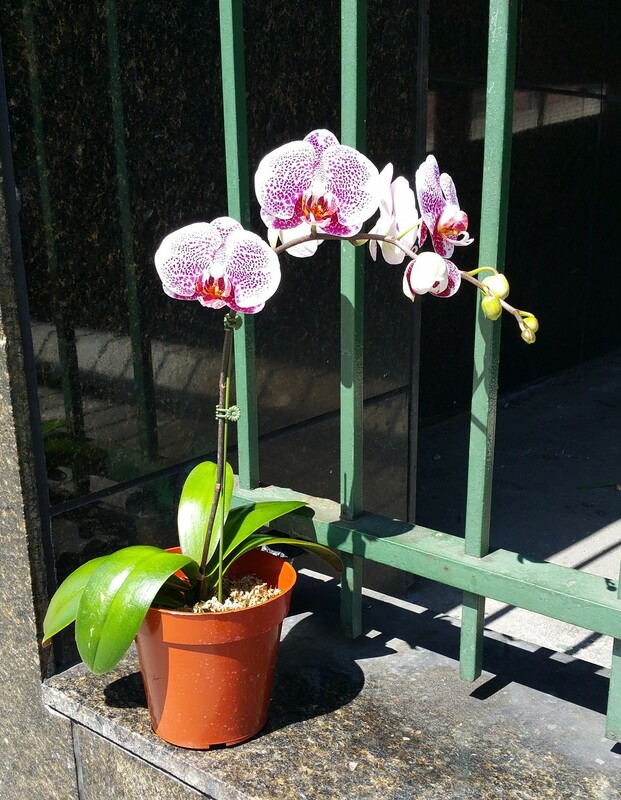 A beautiful orchid to grace our home with its lovely blossoms in honor of Shavuos. This year Memorial Day is coincident with the two-day Jewish holiday of Shavuos, or Pentecost, which starts after the Sabbath on Saturday night. It is when we celebrate the bringing of the law down from Mount Sinai. We traditionally eat dairy meals, as opposed to the meat meals of typical holidays. Imagine a holiday where people wax poetic about cheesecake! Not only that, but we have flowers and plants in our homes because tradition says that Sinai bloomed with beautiful flowers and greenery while waiting for God to give the Torah to Moses on the mountain. I bought a gorgeous orchid for the occasion to enjoy for some time to come. 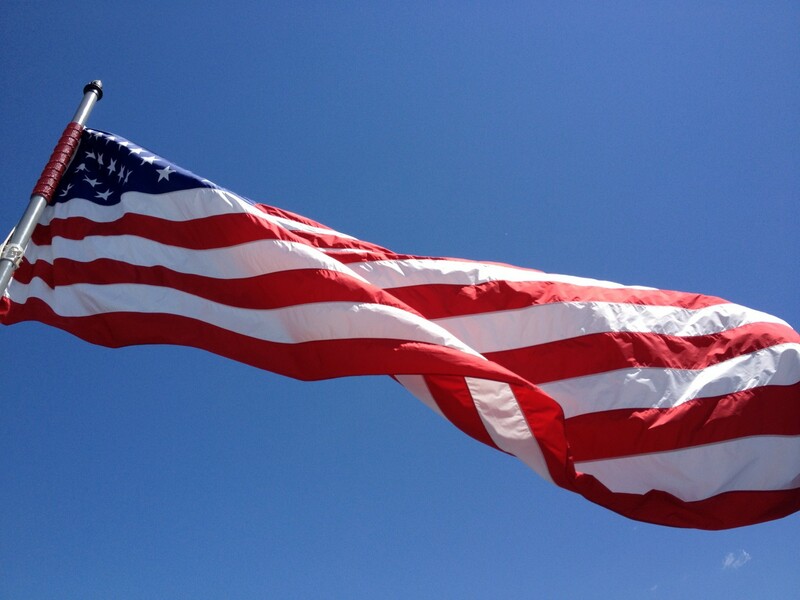 Whether shopping, picnicking, grilling, or just being lazy, I hope all have a wonderful Memorial Day! That’s one of the freedoms our soldiers fought for. 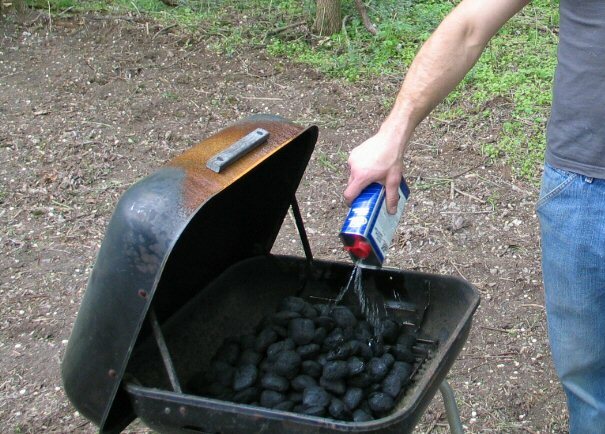 So if you grill this weekend, enjoy a hamburger for me. I’ll be having quiche and cheesecake! The sun shone brilliantly through the tulips and they radiated an ultra-intense color. I basked in the sun on a not-too-hot afternoon. The CNN sign showed 46 °F and there was a gentle breeze. I didn’t need a jacket; it was one of the rare times I sat in the sun to soak up the light. The Traffic hummed, horns blared, taxis whizzed around, and Columbus witnessed it all. That is, the statue of Christopher Columbus, perched atop its 75 foot granite column, anchored the spot. Sometimes I just like to sit in the middle of traffic. 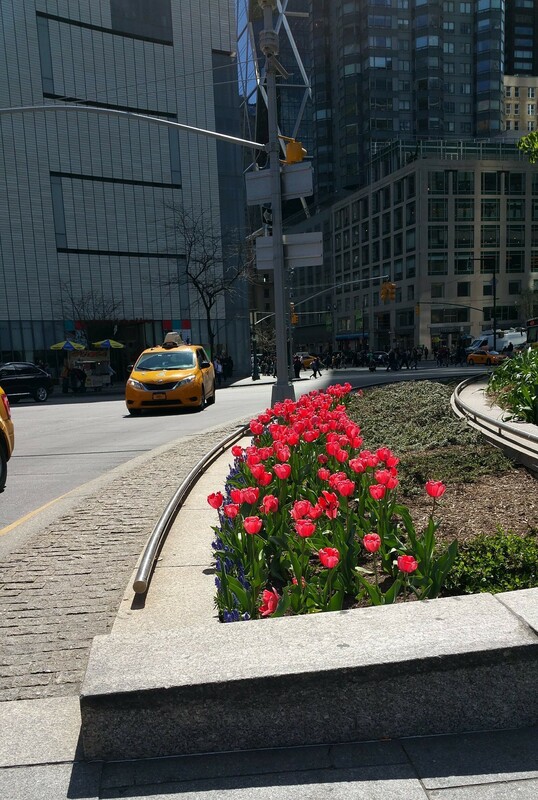 Where better to do so than Columbus Circle? Maybe, like a wheel from its hub, the city radiates from this spot. So many types congregate here, like pigeons in a park. 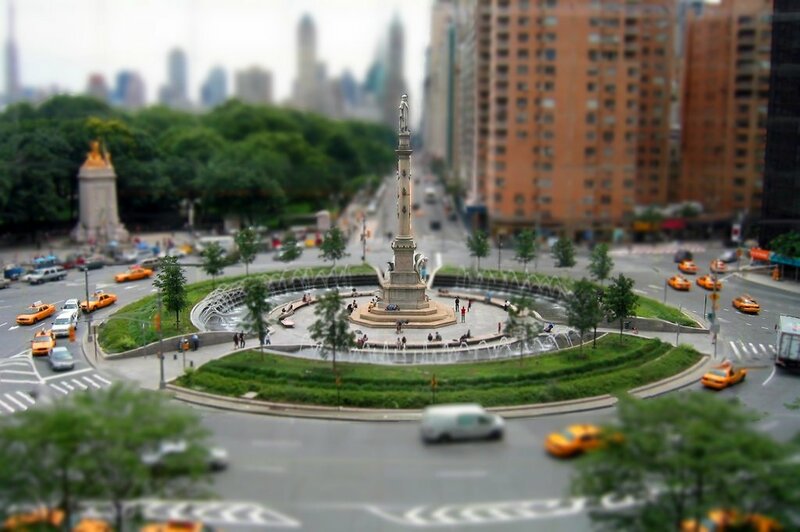 A webcam records Columbus Circle night and day. I found it at http://earthcam.com/usa/newyork/columbuscircle//?cam=columbus_circle. The fountain water wasn’t dancing that day. Pennies, nickels, dimes, and quarters glittered on the bottom of the pools in the brilliantly sparkling water. Pigeons landed, people chatted on phones, coffees were sipped, eyes looked up. Columbus gazed over his dominion, the gateway to midtown. I disliked using the 1-Train Uptown because of the tunnel. Until a few months ago, it symbolized the Portal to Hell, how lost souls would gain entrance to the netherworld. But not now. How it used to be: After exiting the 191st Street Station, the dark, dank, dirty and seemingly-endless long tunnel from the station to Broadway captivated my imagination. I envisioned the helpful city planners and happy artists painting beautiful murals several years ago. But we all suffered the reality of ugly black graffiti, stuck-on posters that someone burned while on the wall, and dirty ineffective lighting fixtures. I even complained about the illumination to the local precinct police. Tunnels don’t bother me; I’m from Pittsburgh, a city replete with tunnels. The specter of violence and/or unsavory occurrences spooked me although regular, law-abiding people traversed it daily. My mind simply worked overtime. I wasn’t scared, just leery (and lazy, weary of walking uphill once I exited on Broadway). Now: The Department of Transportation replaced the lighting with brilliant and energy efficient LED lights last autumn. That transformed the tunnel. It’s still dank and long, but doesn’t awake my automatic dread response. I wish I had a bike or skates to float along its inviting length. Along with the platform renovations, LEDs make the 191st Street Station a safer and more desirable destination. Public art waits to happen here. 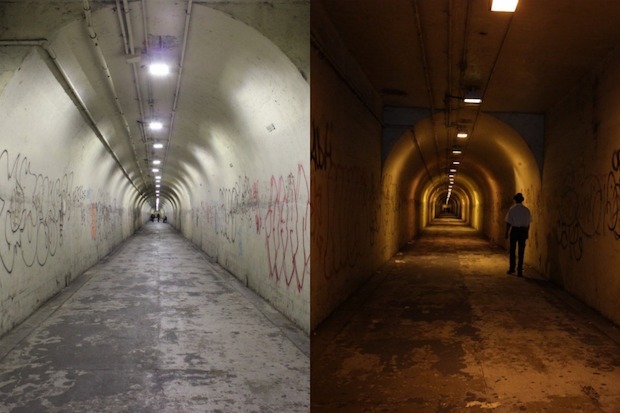 See DNAInfo: City Seeking Artists to Paint Murals for ‘Creepy’ 191st Street Tunnel. I moved to the neighborhood after the “new” mural was already blighted, so I never got to see it in its glory. Curse the taggers and graffiti “artists” who’ve already marred and mauled the tabula rasa of newly painted walls! I, for one, happily await new, creative artwork (not spray paint) that will uplift community spirit and beautify our corner of Washington Heights. My skirt got soaked up past my knees. My feet turned to icicles inside my wet shoes. 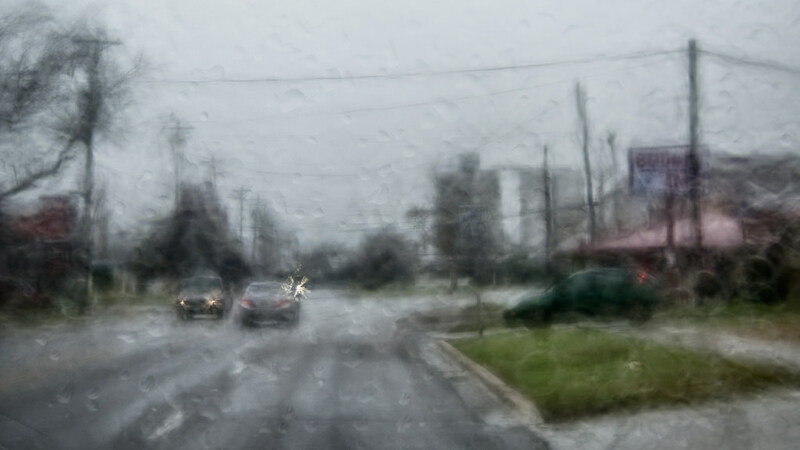 Today gave us the hardest rain–and whipping winds–that I’ve seen for a while. And I had to go out, no ifs, ands, or buts. So I got wet. I leaped from my car to start toward my goal a half block down. See me tiptoeing, as if that would keep my soggy shoes from getting wetter, avoiding the deepest puddles. Since the street was higher than the sidewalk I walked on it, but it was like dodging landmines. Luckily no cars came by to spray me with a fountain of water. The wind tried to whip my umbrella from my hands and I wielded it like a shield, nearly perpendicular to the ground. Dripping and shaking I made it to my destination. Wow, did that cup of tea ever feel so good! Going back out again I reversed my progress. My still damp clothing got drenched again. I cleverly avoided being splashed by five oncoming cars. Clicking the door open, I wrestled my umbrella to close and tossed it on the floor of the passenger side. It brushed the glove compartment, blessing that with a sheet of water. I sat in my car, teeth chattering, blasting the defroster. The interior fogged up while I regained control of my limbs. I don’t have a raincoat because where I’m from you generally jump into the car, then run into your destination. I didn’t need one much. Now located in NYC, I walk places a lot more and find I need one. I have to go shopping for one. Yuck. I hate shopping for myself. I didn’t have rain boots, either. 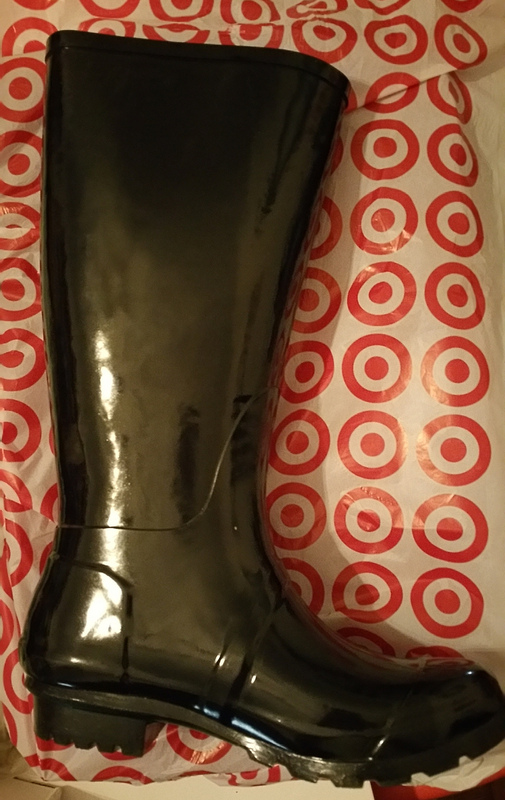 But after this episode, I found a pair at the local Target which 1) fit (yay!) and 2) were reasonably priced (double yay!!). Of course I couldn’t use them right from the store, so my feet got wetter as I ran from store to car. Fortunately, by the time I got home, the rain had subsided to a gentle drizzle. I found a parking spot (triple yay!!!) only 4 blocks from home on the Friday side of the street (Alternate Side Parking rules apply). I clenched my bags, managed the umbrella on my left shoulder, walked slowly so my heels wouldn’t slip out of my overstretched wet shoes, and clumped home. Then I crawled into bed to chase the shivers away. What a day!